I am on a journey. It’s not always easy, and most of the time it’s extremely painful. There are times when I cry out to God saying, “I just can’t do this anymore”, but what I really mean is, right at this moment I don’t feel as if I can do it anymore.” Big difference. This journey means taking a really hard look at those hidden places in my past and learning to become “transformed by the renewing of my mind”. Some days are far more difficult than others. Some days I’d prefer to keep the illusion, thank you very much. But mostly, I want to know the truth. I don’t keep things hidden on purpose; getting to those inward places takes a lot of hard work. Sometimes I don’t even realize that stuff is hidden ‘way deep inside. I’ve had friends who decided that the journey is just too hard. They got to a certain point and just stopped, preferring to live with chaos than to face those deep, painful places. I totally understand why they just don’t feel they can continue. But I am a sojourner, a pilgrim. I am not a quitter. There is this God-given flame burning deep inside that keeps me going, that won’t let me quit. Those hidden places within me need God’s light to shine on them, and I know that He will continue to give me beauty for ashes as I walk this sometimes very lonely path. Angel’s Trumpet flower just starting to open. Bless your heart, I will be praying for you. Beautiful. Journey is my word for this year. I asked God to give me a word to describe what 2009 would be for me and that is what He gave me…Prayers ascending for you. This journey means taking a really hard look at those hidden places in my past and learning to become “transformed by the renewing of my mind”. It is only in that deep, hard work that we truly come to realize the amazing blessings God has in store for us! I will keep you in my prayers as you journey this year. wow, this is deep and thanks for sharing with us! Praying for you on your journey. I know what you mean…it’s a choice and oftentimes a hard one at that. I love what Beth Moore calls this place… the place of “further still.” In our journeys with God, it’s the place that we go alone. We journey so far with the help of friends and family, but then Christ calls us to the place of “further still” where it’s just he and us. No doubt He is transforming your mind throughout this process and He will in fact, as your WFW suggests “make you new.” Blessings, sweet one. This was a beautiful and heartfelt post. I understand about Journey’s. I will pray for you and your struggles. I love the photo and the verse you chose. And thanks for coming by to see me today. Just remember that even in the darkest times or the times you feel God is distant that he really isn’t. He is there waiting for you to listen. Which is the hardest to comprehend him. Just rest in his peace and he will show you. Nice one. 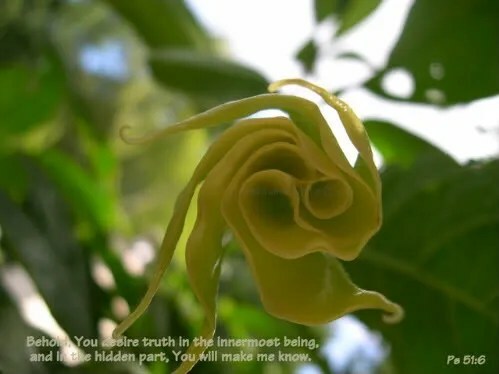 I love your Angel’s Trumpet pic, too. They are one of my favorite plants. God bless you as you continue on your journey and trust Him with what He reaveals and heals inside of you! Praying for strength for your journey and for the sweet relief and peace of Christ’s love. Happy WFW! Wow, what a testimony. Love it. Through Him, we have overcome! You’re setting a great example. Beautiful, heartfelt post… God is carrying you my friend! You’re in my prayers. The journey becomes easier to understand when we realize that we are already living in eternity so we have to choose to make a place of joy and happiness by releasing/ letting go of the past. We can’t live in the now if our past keeps summoning us back. Keep on keeping on! beautifuly said.. hugs my sweet friend!